There are no beaches in the city itself, so you will need to take a bus ride or drive to sunbathe or swim. 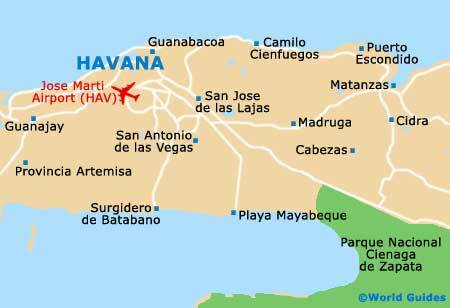 Varadero, a couple of hours to the east, has the best of beaches and is a fun, pumping holiday resort. This ranks as Cuba's top beach resort town and comes with literally miles of stunning beaches, as well as plenty of entertainment options. Nearer to the Cuban capital of Havana are the Eastern Beaches (the Playas del Este), although these are still a 30-minute bus ride away. Buses regularly depart for the Playas del Este from the Hotel Inglaterra. Many refer to the Playas del Este as Havana's Riviera and these beaches are at their closest within the nearby resort of Bacuranao. The coastline heads further east where it encompasses Tarara, El Meganao and Santa Maria del Mar, as well as the resorts of both Boca Ciega and Guanabo. These beaches and resorts remain far less developed than those around Varadero, although the facilities are good and tourist numbers can be high during the summer holiday season. The Playas del Este stretches for some 9 km / 6 miles and offers much more than just sunshine and soft sand. Various water sports present themselves here, and day trippers from Havana often come to Tarara for its excellent scuba diving, kayaking, yachting and swimming opportunities. Santa Maria del Mar is where the highest number of resorts are based, offering a lively and enticing nightlife, while Boca Ciega is known for its burgeoning gay scene. Guanabo is a good bet for cheap accommodation, and a number of casas particulares are to be found just a stroll from the beach itself.